The highly anticipated X-Men Origins: Wolverine is releasing next year and I couldn't be happier with the way it looks like the film has shaped up. X-Men: Last Stand was a nightmare and left a bad taste in my mouth everytime I even heard the word X-Men, but the new Origins film looks to be mighty worthy of a walluping good time! 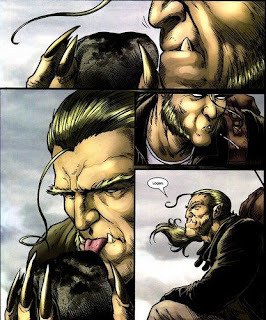 One of the villains of X-Men lore I have always loved is Victor Creed and in X-Men Origins: Wolverine it appears we will get a health chunk of him. This time around Liev Schreiber has taken on the claws of sabretooth and he had a few things to say to Collider about being in the film. Schreiber talked with Collider about a variety of things ranging from working with Jackman to how he landed the role of Victor Creed/Sabretooth. 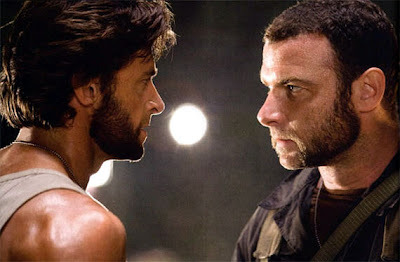 Schreiber started off by saying that he had a real blast filming X-Men Origins: Wolverine. "It was insanely fun," Liev said. Although Schreiber said that he did have a few worries about taking on the mantle of such a famed villain. "I felt very self conscious initially because I knew fans didn't like that idea of me playing Sabertooth. I think I am perceived as a kind of urbane New York … I don't know maybe I've done too many movies with Jewish characters [laughter] and they're like "It's like Woody Allen playing Sabertooth" and I'm like no actually it's not." Schreiber insisted that he can definately handle the role by adding, "I'm 6 foot 3, I'm bigger than Hugh Jackman, [laughter] I can do this." Schreiber displayed that he clearly has gotten over the fact that fans weren't initally responsive to him. Liev Schreiber went on to talk about his conditioning he went through to prepare for the role. "I began this kind of four month training period, weight lifting period genocide of chickens phase of my life where I just got bigger and bigger and it was awful but amazing and fun." Liev put in four months of work and by th elooks of the released image he beefed up quite a bit. Schreiber went on to talk a bit about working with Jackman in fighting scenes. "I got to choreograph the fights with Hugh and get on the wire and do the work it was not just fun, I saw some footage it's pretty cool." The last thing Schreiber and Collider talked about was how he got the role in X-Men Origins and had he been a fan prior to being cast. (Has there ever been an actor dumb enough to say, "No"?) 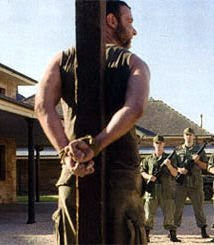 Schreiber reveals that he was in fact persued to play the role of William Stryker and not Victor Creed intially. "Initially I was asked to play Striker and I asked "is there any chance I might be able to play this Victor Creed guy?"" Schreiber went on to say that he was a reader of X-Men and had his eyes on Creed. "I read the comics before I got offered the part. I mean, I knew the character really well," Schreiber said. Liev summed up by explaining how he approached the notorious villain. "The research that I did on it. Victor's particular mutant issue has nothing to do with his name Sabertooth, but that was the place I decided to start. Just what is a Sabertooth and how does that work? How do they move? What are their behavioral characteristics? I knew this stuff from the comic, I knew that he was just a complete savage street fighter and that was his MO but what I hadn't seen in some of the earlier films that I was curious to kind of pursue is what drives the guy and what are the kind of qualities- I guess for be it's the same thing with a character like Zus- rather than just say they're a violent brute what's the cocktail that makes the brute tick. Hopefully people will like it." Hmmm interesting, at least the guy did his home work or had someone do it for him.